Instead of investing in real estate property directly like equity real estate investment trusts (REITs) do, mortgage REITs borrow in the repo markets and invest in mortgage backed securities (MBS) -- mostly residential MBS issued by Fannie Mae, Freddie Mac, and Ginnie Mae. The current environment of low interest rates has kept the borrowing costs low for mortgage REITs, facilitating their outstanding growth. The figure shows the market capitalization for all listed mortgage REITs and the total assets for the two largest players in the industry: Annaly Capital Management (NLY) and American Capital Agency Corporation (AGNC). 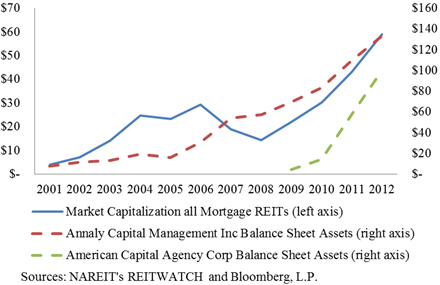 Even though their business model experienced setbacks during the financial crisis (due to lack of funding for short-term borrowing), the market capitalization of all mortgage REITs has increased by almost 15-fold in the last twelve years. Their growth accelerated from 2008 onward, when the Federal Reserve’s policies drove borrowing rates to record lows. Retail investors can directly purchase mortgage REITs through their brokerage accounts. What they may not know is that mortgage REITs are not regulated investment companies and hence do not afford investors the benefits of the Investment Company Act (PDF). Many open-end and closed-end investment companies invest in agency MBS, just like mortgage REITs, but must comply with leverage limits established in the Investment Company Act. For example, closed-end companies may only borrow up to 33% of their assets. By contrast, the average debt-to-asset ratio of listed mortgage REITs is over 84% according to REITWatch. This higher leverage can enhance returns when the market is doing well but it also poses a higher risk of losses in the event of a downturn. The added risk caused by the leverage embedded in mortgage REITs is one of the reasons behind a 2011 inquiry by the Securities and Exchange Commission (SEC) into the mortgage REIT business. In the SEC’s concept release and request for comments (PDF), the SEC states that “certain types of mortgage-related pools today appear to resemble in many respects investment companies such as closed-end funds and may not be the kinds of companies that were intended to be excluded from regulation under the Act.” It is likely that the sector’s outstanding growth and increasing risks will attract further attention from the regulators. Another issue that investors should consider is the management capabilities of some of the mortgage REITs. A negative consequence of the high growth in the sector is that REITs that started out as relatively small players and have benefited from outstanding growth may currently have an asset portfolio that exceeds their management capabilities. Armour Residential REIT Inc. (ARR), whose assets have ballooned from $250 million at the end of 2008 to over $20 billion at the end of 2012, has been described as an example of a mortgage REIT whose management may have difficulty keeping up with the risks of its growing balance sheet. As the economy shows signs of recovery, it seems likely that the Federal Reserve’s policy will shift in the near future. A rise in the short-term interest rates will directly affect the profitability of the mortgage REIT industry, by reducing the wedge between the interests earned on its long-term investments and its short-term borrowing costs. In addition, a large-scale sale of MBS by the Federal Reserve could depress the prices of MBS and negatively affect the price of the portfolio holdings of mortgage REITs. * The high leverage typical of the industry may exacerbate these risks. We will continue to monitor mortgage REITs and their rising risks. * The Federal Reserve has amassed about $1 trillion in agency mortgage backed securities. For the Federal Reserve's balance sheet, see the Federal Reserve Board’s flow of funds report (PDF). Yakob Peterseil of Risk.net recently noted that "[b]anks are boosting issuance of leveraged notes linked to US equity indexes and notes that pay out when yield curves steepen." According to the article, reverse convertibles and buffered notes are seeing a resurgence as investors begin to be more optimistic about stock market growth. In addition, principal-protected structures like structured certificates of deposit and principal-protected notes are falling out of favor as attractive terms are hard to come by and investors continue to hunt for yield. The important thing investors need to remember is that even if they're generally optimistic about the future growth of the stock market this growth expectation is already priced into the structure of the product: a reverse convertible might offer a slightly lower coupon rate or a buffered note might have a more stringent cap. In the end, structured products are high-cost/high-risk debt securities that amount to a complex combination of derivatives and corporate bonds. An interesting case study of the risk embedded in reverse convertibles is contained in the notes linked to Apple common stock (AAPL). Yakob mentions that "[w]hen Apple at one point lost more than 20% of its value, the notes converted into Apple shares at depressed prices – to the surprise of some investors." We've discussed exactly this point when we wrote a paper (PDF) discussing the decline in market value of Apple-linked structured products earlier this year (see also the update located here). For more information on a particular structured product, visit our searchable structured product database containing over 16,000 individualized structured product research reports. 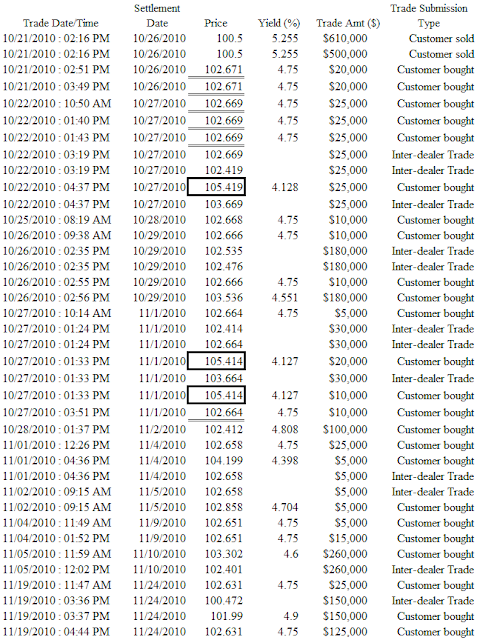 According to the complaint (PDF), since at least 2008 Blake Richards, "a registered representative of a broker dealer, misappropriated at least $2 million from at least seven investors." Allegedly, the "majority of the misappropriated funds constituted retirement savings and/or life insurance proceeds from deceased spouses." An order was issued that "temporarily restrained Richards from further securities laws violations, froze Richards’s assets, prevented the destruction of documents, and expedited discovery." The SEC has charged Richards with violating various provisions of the Securities Act and Exchange Act and seeks permanent injunction, disgorgement, prejudgment interest, and civil penalties. According to the complaint (PDF), John A. Stilwell along with his friend, Dr. Michael C. Moore, and sister-in-law, Jillian M. Murphy, traded on insider information that Stilwell gained from his brother, an American Physicians Capital, Inc. director. The insider information involved ACAP's possible acquisition by The Doctors Company. Moore and Murphy allegedly each tipped another person. In total, the four tippees made almost $62,000 in illicit profits. The defendants agreed to settle charges by agreeing to a final judgment that permanently enjoins them future violations of the Exchange Act, as well as orders them to pay disgorgement, prejudgment interest, and financial penalties. A final judgment was entered against China Yingxia's former chief financial officer, Ren Hu. Hu allegedly made "fraudulent representations in Sarbanes-Oxley certifications" and failed to "implement internal controls, aided and abetted China Yingxia's failure to do so, and made materially misleading statements to auditors concerning such controls and potential fraud by the CEO." The final judgment imposes a permanent injunction against Hu from future violations of the Exchange Act and also "imposes a 3-year officer and director bar against Hu but does not include any civil monetary penalty based on Hu's financial condition." According to the complaint (PDF), father-and-son duo, Charles J. Dushek and Charles S. Dushek, along with their investment advisory firm, Capital Management Associates, Inc., (CMA) defrauded "CMA clients in a cherry picking scheme that garnered the Dusheks nearly $2 million in illicit profits." The scheme went on for 17 quarters and caused at least one of "Dushek Sr.’s personal accounts [to] increase...in value by almost 25,000 percent." The SEC has charged the defendants with violating various provisions of the securities laws and seeks permanent injunctions, civil penalties, disgorgement, and prejudgment interest. Additionally, Margaret Dushek was named as a relief defendant. According to the complaint (PDF), Robert Fowler and his company, US Capital Funding Series II Trust 1, defrauded " investors in a 'prime bank' investment scheme." Last August, the defendants allegedly "raised at least $350,000 from investors by falsely promising high profits for investing in standby letters of credit or bank guarantees that would purportedly grant the investors loans, the proceeds of which would be invested for a significant profit." These funds were misappropriated by Fowler and US Capital for "personal and business use." According to the SEC, Fowler preyed on "foreign-born small business owners with little or no experience in finance or investing." The SEC has charged Fowler and US Capital with violating the antifraud provisions of the securities laws and seeks "permanent injunctions, disgorgement of ill-gotten gains with prejudgment interest, and civil penalties." Final judgments were entered against Stephen B. Blankenship and his investment advisory firm, Deer Hill Financial Group, LLC for allegedly engaging in a scheme that defrauded investors of at least $600,000. The final judgment enjoins the defendants from future violations of the securities laws. Additionally, the SEC has "barred Blankenship from working in the securities industry." Criminal charges arose from the same alleged misconduct and on December 5, 2012 Blankenship was sentenced "to forty-one months imprisonment plus three years of supervised release and ordered...to pay a fine of $7,500 and restitution in the amount of $607,516.81." Yesterday the Securities and Exchange Commission (SEC) charged the City of South Miami with defrauding investors over the tax-exempt status of some municipal offerings. In 2002, the City of South Florida obtained access to tax-exempt financing through a pooled conduit municipal bond issued by the Florida Municipal Loan Council (FMLC) to fund the construction of a mixed-use retail and parking structure in the city's commercial district. * The 2002 FMLC bond offering can be found here (PDF). The funding was meant to cover the portion of the construction costs attributable to the parking structure in which the city would remain full control and receive all parking revenues. The city's access to tax-exempt financing depended critically on the limited role of the for-profit developer. City officials became concerned with the municipality's ability to pay the debt service on the bonds and subsequently cancelled the project. Litigation with the developer followed and a settlement was reached in which the developer would lease the entire project (including the parking structure), jeopardizing the tax-exempt status of the bonds. The City of South Miami sought additional funding from FMLC in 2006 to continue the project. However, in seeking this new funding the city omitted information concerning the new lease with the developer. FMLC issued pooled municipal bonds (PDF) in 2007 based on this omission and other material misrepresentations. City officials were reportedly aware of the failure to comply with IRS rules for tax-exempt financing and continued to issue certifications that the city was in compliance with the terms of the loan agreements. It was not until July 2010 that the city formally recognized the adverse impact of the renegotiated lease with the developer on the tax-exempt status of the 2002 and 2007 bonds. The City of South Miami has settled with the IRS resulting in nearly $1.5 million in additional costs. From the viewpoint of the bondholders, the settlement effectively preserved the tax-exempt status of the bonds. The City of South Miami has agreed to retain an independent third-party consultant to review financial disclosures and ensure compliance. The SEC order instituting cease-and-desist proceedings can be found here (PDF). * A pooled municipal bond offering is one in which an issuer uses the proceeds from a bond issuance to make loans to a set of municipalities. A conduit municipal bond is issued by a municipality that then loans the proceeds to a private entity. The private entity then repays the loan to the issuer and the issuer pays bond investors from the proceeds. Typically the municipality is not responsible for making up shortfalls on loan-repayments and as such these bonds are considered more risky than vanilla/non-conduit bonds. For more information about the basics of municipal bonds, see the Municipal Securities Rulemaking Board's website. It is looking more and more like collateralized debt obligations (CDOs) and other asset-backed securities-- the 'toxic' assets highlighted as some of the worst excesses of the financial crisis--are back. And while the agencies that rate asset-backed securities are still at the center of the debate over the validity of these investments, at least one of them is trying to improve its explanation of their labyrinthine terms and conditions. Fitch has recently published the first example of their new "Indenture Abstracts," which provide a relatively digestible summary (at least to those familiar with these structures) in a form that is easier to navigate and more logically organized. The example* covers the Race Point VIII Collateralized Loan Obligation (CLO) which closed on February 20 of this year. The March 13, 2013 prospectus for Race Point VIII CLO can be found on the Irish Stock Exchange's website. You'll notice that the prospectus is a staggering--though by no means unusual--three hundred pages of dense text that is cumbersome to parse. What Fitch has done with their new indenture abstracts is to provide a synopsis of some of the most important features of the deal in less than fifteen pages. In addition, Fitch compares each deal with other similarly structured deals priced around the same time. On page 2 of the indenture abstract, Fitch compares Race Point VIII to it's predecessor Race Point VII CLO as well as two other deals of comparable size priced within a month of Race Point VIII. The comparison covers a broad range of important characteristics ranging from coupon rates of senior debt to the minimum weighted average spread on the portfolio constituents. Perhaps our favorite feature is their abbreviation of principal and interest waterfall payments (page 7). These waterfalls determine if, when, and how much investors will receive for their investment in the CLO. This abbreviated structure allows investors to easily locate themselves in the waterfall and determine if that is where they would like to be in the priority of payments. Obviously by dropping nearly three hundred pages from the prospectus, important information and disclosures are going to be lost. Any document of this type will not replace the prospectus, which still must be reviewed carefully by any potential investor. That said, good summaries of asset-backed securities are hard to find, and Fitch's abstracts are a significant improvement over previous descriptions. We applaud Fitch for their efforts to bring more transparency to this often murky market. * Access to the abstract is free, but you will need to create an account with Fitch. In theory, exchange traded products (ETPs) can be linked to almost any underlying asset, including derivatives. While many ETPs are linked to portfolios of bonds or stocks, some are linked to portfolios of futures contracts, which we have discussed at length before. Bill Luby at VIX and More has written a couple posts on ETPs that are linked to portfolios of options, which are gaining some traction with investors. As usual, we greatly enjoyed Bill's posts and thought we'd explain some of the mechanics behind the option strategies embedded in these ETPs. More information about the basics of options can be found here. The first strategy we'd like to talk about is referred to as a "covered call" or "buy-write". This is the strategy implemented by PowerShares S&P 500 BuyWrite ETF (PBP), iPath CBOE S&P 500 BuyWrite Index ETN (BWV), Credit Suisse Gold Shares Covered Call ETN (GLDI) and, most recently, Credit Suisse Silver Shares Covered Call ETN (SLVO). In options parlance, a covered call refers a position that is both long some asset and short a call option on that asset: the short call is 'covered' by the long position in the underlying asset. 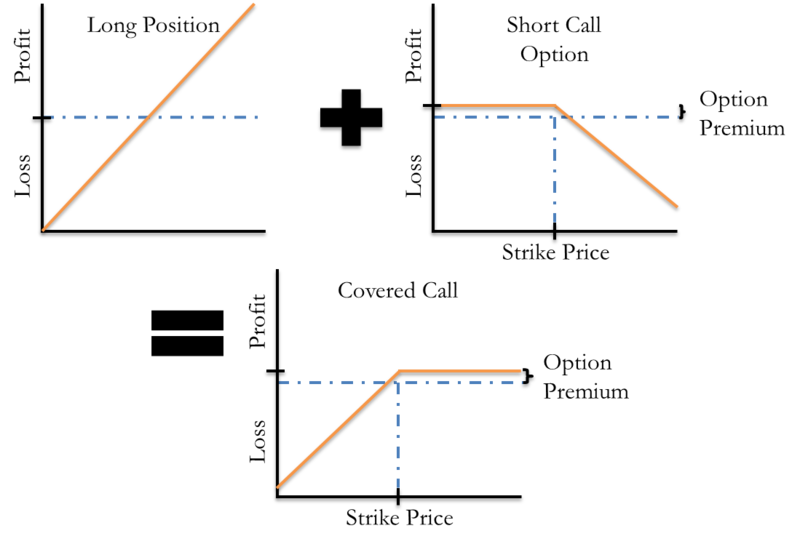 The figure below explains the profit and loss of this combined position graphically. The covered call strategy generates income by selling call options (thus earning the option premium), but in doing so misses out on any increase in the value of the asset above the call strike. This strategy is particularly effective in markets without significant appreciation (since the investor would miss out on said appreciation) or depreciation (since the option premium would provide little protection against losses). Generally speaking, the closer the strike price is to the current asset price, the more income is generated and more upside potential is lost. Another closely related strategy that has been implemented in ETPs is the put-write strategy. One ETP that implements this strategy is the ALPS US Equity High Volatility Put Write (HVPW). You might have noticed that the covered-call strategy looks very much like a short put option. Well, that is the essence of the put-write strategy. 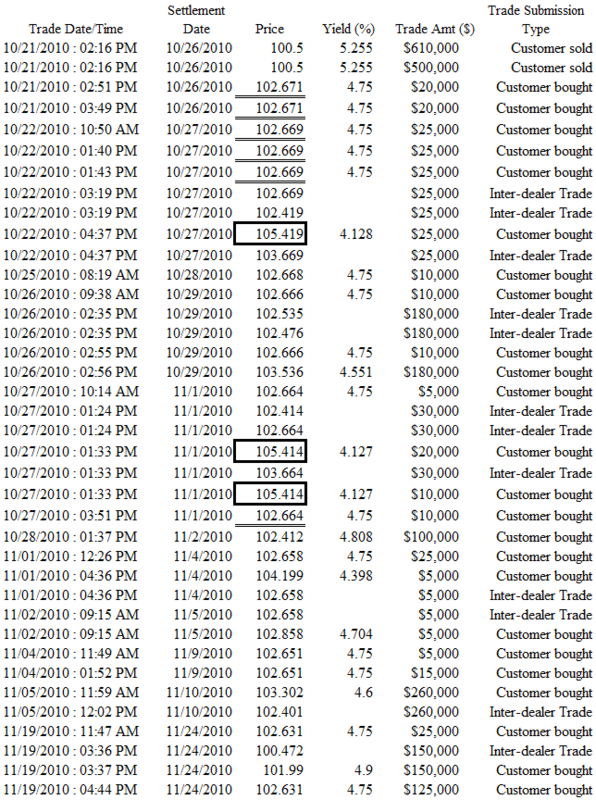 The strategy sells put options and profits when the put options expire worthless. This strategy has gained significant attention since the CBOE began publicizing the PUT index (noting that the PUT index returned a staggering 1150% compared to the S&P 500 returning 800% between 1986 and 2012). What makes these ETPs interesting is that it gives investors a way to invest in moderately complex option strategies without really understanding their mechanics. If an investor wanted to implement a covered call on their own, they'd have to worry about when (and how) to sell the call, when to cover the short position and rolling the position forward periodically (repeating this process all over again). ETPs wrap this process up into (a perhaps too easily) digestible package. Last week, both the Securities and Exchange Commission (SEC) and the Financial Industry Regulatory Authority (FINRA) issued investor alerts concerning pension and structured settlement income streams. The SEC's investor bulletin can be found here (PDF) and FINRA's investor alert can be found here. We haven't discussed the potential problems surrounding pension or structured settlement income streams before, but these regulatory notices highlight some of the potential issues that we think are important for recipients and investors to understand. A structured settlement is typically a stream of payments representing the resolution of litigation (e.g. personal injury lawsuits). Similarly, pensions represent a defined-benefit income stream compensating an employee during retirement. These income streams are valuable assets and salespeople are hoping to convince recipients to exchange the stream of payments for a lump-sum payment. Unfortunately, the compensation investors are receiving in exchange for these income streams are often risky, complex and (in many cases) insufficient. * In addition, there may be substantial tax consequences of participating in such a transfer that might not be understood or appreciated by investors. The SEC offers guidance on the questions that investors should ask before entering into such a transaction. For example, are there better alternatives (e.g. bank loans)? Is the transaction even legal? The regulators also suggest checking out the company's Better Business Bureau record, as well as the salesperson on the SEC's Investment Advisor Search, FINRA's BrokerCheck, the appropriate state securities regulator or the National Association of Insurance Commissioners. On the other side of the coin, salespeople are selling investors the rights to pension and structured settlement income streams that they have purchased from other recipients. These investments often advertise yields exceeding 5% or even 7%, but there are numerous potential risks: reliable information might not be available for these products, investors "may encounter commissions of 7 percent or higher," the products are usually hard to sell once bought, and investors may face legal challenges enforcing the income stream if it is based upon someone's pension. Furthermore, investors are exposed to the credit risk of the company or organization that is required to make the stream of payments. According to the SEC investor bulletin,"if that entity goes bankrupt or becomes insolvent, it may stop paying the income stream." Investors should be very cautious before entering into one of these transaction (if at all). There are many risks that are often not fully disclosed and may have long-term financial consequences. * Some states require that companies that offer such an exchange, called "factoring companies", disclose the difference in value to avoid the exploitation of income stream beneficiaries. For more information, see the following document (PDF) from the Los Angeles County Bar Association. According to the SEC's complaint (PDF), China-based company, Subaye Inc and its former CFO, James T. Crane, "misrepresented the company’s business and operations, deceived the company’s auditors, and misled investors about the company’s true status and revenues." The SEC alleges that the defendants claimed Subaye had over 1,400 sales and marketing employees in 2010, "with reported revenues of $39 million that fiscal year and projected revenues of more than $71 million for 2011," when in fact the company had "no verifiable revenues, few...real customers, and no infrastructure to support its claimed cloud computing business." Additionally, Crane allegedly falsified books and records to mislead outside auditors. Crane and his firm were sanctioned in 2011 by the PCAOB, and Crane was barred from "being associated with a registered accounting firm or being associated with any public company in an accounting or financial management capacity." Crane allegedly violated this order by remaining as Subaye's CFO until March 2011. The SEC has charged the defendants with violating various provisions of the securities laws and seeks permanent injunction, as well as payment of disgorgement, prejudgment interest, and penalties. According to the SEC's complaint (PDF), Richard Verdiramo, RECOV Energy Corp.'s former Chairman, CEO, President, and CFO, committed "fraud and violat[ed] the securities registration requirements based on his issuances of RECOV stock for his and his father’s personal benefit." His father, attorney Vincent L. Verdiramo, allegedly "facilitated the misconduct." Previously, the Court ordered the defendants to pay full disgorgement and suspended Vincent L. Verdiramo from appearing or practicing before the SEC as an attorney. An April 2013 judgment requires the defendants to pay over $1.06 million in additional disgorgement, prejudgment interest, and penalties. It also places a penny stock bar against Vincent L. Verdiramo. Final judgments were entered against Grant Ivan Grieve and his Finvest advisory firms ordering them to pay over $26 million in disgorgement and civil penalties. The defendants allegedly "fabricated and disseminated false financial information for their Finvest Primer hedge fund that was 'certified' by a sham back-office administrator and phony auditing firm that Grieve himself created." Both defendants were charged with violating various sections of the Securities Act, Exchange Act, and Investment Advisors Act. Eric R. Nelson and Kevin J. Wilcox settled charges with the SEC and a default judgment was entered against Jennifer E. Thoennes, "arising from their alleged participation in a Ponzi scheme operated by Joseph Nelson." Eric R. Nelson and Wilcox have been permanently enjoined from future violations of the securities laws and have been ordered to pay almost $350,000 in disgorgement and prejudgment interest. However, all but payment of $23,230 has been waived due to the financial conditions of the defendants. A final judgment was entered last December, permanently enjoining Thoennes from future violations of the securities laws and ordering her to pay over $94,000 in disgorgement, prejudgment interest, and penalties. Since reaching $700 in September of 2012, Apple's stock price (AAPL) has fallen dramatically -- trading in the high $300's for a few days in April 2013. The previous version of the paper focused on the losses experience by Apple-linked structured product investors as a result of their January 23, 2013 earnings announcement (SEC Form 8-K) after which the price of Apple common stock fell more than 12% -- a loss of more than $50 billion in market capitalization. The updated analysis shows that Apple-linked structured product investors continue to bleed value. The following figure shows the aggregate market value (as calculated by SLCG) of Apple-linked structured products outstanding between January 23, 2013 and April 24, 2013. The aggregate market value of the 283 products in the sample fell over $37.6 million following the January 23, 2013 earnings announcement. Between January 24, 2013 and April 24, 2013, SLCG estimates that these products lost an additional $37.2 million in value. ** These results should reinforce the fact that investors in equity-linked structured products are exposed to extraordinary market risks. For more detailed information concerning these losses, please see our working paper on this issue. SLCG has also compiled a database of over 16,000 structured product research reports (over 800 linked to Apple) including full valuation and analysis of each product. 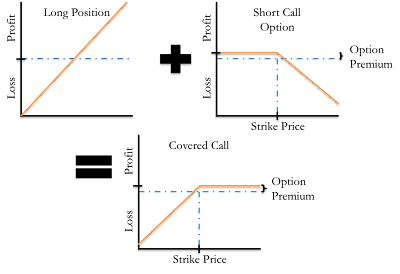 * The types of structured products considered in the study were reverse convertibles (example), single observation reverse convertibles (example) and autocallable reverse convertibles (example). ** The aggregate market value of these products correlated very strongly (correlation higher than 0.99) with the closing price of Apple stock. Earlier this week, the SEC charged the City of Victorville, California and several other entities with municipal bond fraud. The charges relate to a $13.3 million 2008 bond offering by the Southern California Logistics Airport (SCLA) Authority, which was intended to refinance an "ill-conceived" redevelopment project for airplane hangers at the former George Air Force Base, which closed in 1992. Municipal bonds are sometimes considered among the safest investments available. Municipal bond markets have been tested in recent years by increasing public debt burdens in many cities as well as the high profile default by Stockton, California. The alleged fraud in Victorville reveals some of the difficulties in municipal finance, which in this case may have led city officials and others to mislead investors and the public about the financial condition of certain assets. each underwritten by Kinsell, Newcomb & DeDios (KND), "a broad-based, enterprising investment banking firm". The SCLA borrowed an additional $35 million in short-term funding in February 2008 through a private placement with an unnamed bank. The authority issued $13.3 million Subordinate Tax Allocation Revenue Bonds in April 2008. The bonds were issued to repay part of the debt in the private placement as a result of the exercise of an option by the bank that bought the February 2008 bonds (paragraph 62 of the complaint). This April 2008 financing was based upon a $65 million valuation of four airport hangars. This valuation was in spite of the fact that the county assessor had previously valued two of the four hangars at a little less than $9 million a piece. Prior to the April bond offering and after the February private placement, the county assessor provided a valuation of less than $10 million for the third hangar and estimated the fourth hangar would be similar since it was "identical". As a result, the county assessor valued the four airplane hangers at $27.7 million; however, in the April bond offering documents, the value of the hangers was reported to be $65 million. The valuation of the hangars is of paramount importance for the bond investors since the value of the bonds is based upon incremental tax revenue. In other words, payment is based upon the "increase in property tax revenues resulting from an increase in the aggregate assessed value of the property within the relevant redevelopment area." According to the SEC, the reason for the misstatement was that as credit markets were tightening in 2007-2008, investors were requiring higher debt service ratios than before. Debt service ratios, in the context of tax increment bonds, compare the amount of incremental property tax revenue that is available to pay off a bond with the total payments required on that bond. For example, a ratio of 1.5 would mean that the available tax revenue was 1.5 times the amount required to service the debt. According to the SEC, "nearly all of the tax increment available to the Authority had been used to secure its prior bond issuances," and the debt service ratios required by investors increased from 1.10 to 1.25. The SEC alleges that the mis-statement of the value of the hangers was false and misleading, and have charged the City, the SCLA Authority, KND, and several related individuals with securities fraud. Earlier this week, the Investment Program Association (IPA) presented their guidelines for the valuation of publicly registered non-listed REITs. According to the IPA, these guidelines are supposed to "enhance the independence of the valuation process" and "enhance the quality of valuation disclosures to the investing public." For a discussion of the guidelines, see Brian Louis's recent story on Bloomberg.com. Non-traded REITs -- real estate investment trusts that are registered with the SEC but do not trade on a public exchange -- have come under a lot of scrutiny in the past few years (see our many posts on the subject). One of the many criticisms of non-traded REITs is that it is very difficult to determine how much their shares are worth; that is, they have very little price transparency. Typically, non-traded REIT shares have been sold at a set price. For most non-traded REITs, that price was $10 per share, and stayed $10 per share even through the real estate collapse of 2007-8. So while the value of the REIT's assets were declining, the price investors paid was the same. This was made worse by the high upfront fees and commissions on non-traded REITs, which left as little as 85-90% of the invested capital going towards actually purchasing properties. Even though the real estate collapse was big news, it was often difficult for investors to know if or how that collapse affected the properties owned by the REIT since there was almost no market analyst coverage of the non-traded REIT industry. For a while, this lack of transparency was even touted as a feature, not a problem, by non-traded REIT sponsors and brokers. They claimed that non-traded REITs 'lacked volatility' and weren't susceptible to 'market fluctuations. '* But just because the price charged for each share didn't change, didn't mean the value of each share wasn't fluctuating -- or plummeting. When FINRA started requiring non-traded REITs to publish per-share net asset value (NAV) figures, many REITs showed prices per share of less than $7, and some even less than $5 or worse. Which brings us to today. The non-traded REIT industry has backed away from their claims about 'lack of volatility' and are now thinking about the best way to calculate NAV for non-traded REITs. It's actually a tricky problem. Real estate assets are seldom bought or sold and are appraised only infrequently. Most valuations depend on assumptions about future vacancy, rent rates, and other factors that are hard to predict. So it's not so easy coming up with a valuation for a whole portfolio of different types of properties. For REITs that are publicly traded, this isn't a problem. Shares of traded REITs are traded just like any other stock, so their market price reflects the demand for shares in a liquid market. The market essentially values the REIT's portfolio for them, using the public disclosures required of traded securities. So far, non-traded REIT valuations have been largely at the discretion of the REIT's management, which means each REIT uses a different methodology and per-share values aren't directly comparable. Also, there is an inherent conflict of interest when a company values its own shares. This is in addition to the fact that valuations based on the underlying assets are often stale -- based on data many months or even years old. The objectives of the IPA's guidance highlight the need for quick, independent, and standardized calculations. But it makes you wonder--if it's so difficult for even the REIT itself to value its portfolio, why are non-traded REITs being sold to retail investors in the first place? And if greater transparency is the goal, why not list on a major exchange?